WOW!! 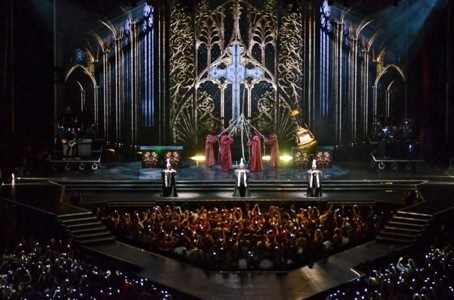 Madonna was fantastic tonight at Murrayfield in Edinburgh. We had seats in the east stand to the left of the stage, and although we were on the back row they weren’t bad seats. The only down side was that we had a side view of the stage, and therefore missed the full visual effect of the set. However the concert was a great balance of current songs mixed with the crowd pleasing hits. Mind you, we did have some enthusiastic ladies either side of us. The one next to me thought it would excuse her behaviour by telling me before it started “I’ll probably be screaming and singing…hope you don’t mind’ ….well actually I do, especially when your singing sounds like a cat who’s had its paw stepped on. Plus Dave had a buxom mid-forties woman trying to shake her bootie and clap very widely over her head….meaning Dave had to duck now and again to avoid a slap in the face from the bingo wings ! !